It was very kind of the Mayor to thank us for moving quickly to provide computer equipment and technical support to the PG2C offices. It is our pleasure to work with a program that has such incredible potential. However, what I zeroed in on was his reference to “a couple nanoseconds.” Fast is never fast enough in the IT world! IT needs to remain nimble, as we work in an arena that is constantly changing. These days it would be nearly impossible for any program, service, or idea to get rolling without technical support, PG2C being a perfect example. From basic infrastructure and hardware, to technical support from my fellow IT people, programs like this need us to be quick on our feet so they can meet the needs of the people they are trying to serve. 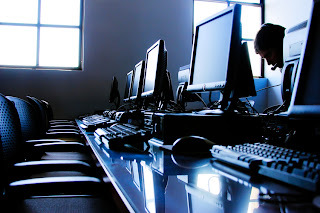 Searching online for a school that might be the right fit for you, researching its programs, downloading the application -- none of these steps in the college process would be possible without current technology and software, well designed and useful programs, and technical resources that keep things running smoothly. I look forward to seeing where PG2C goes now that they’ve hit the ground running!